Medical science breakthroughs have created an intelligent light technology that removes the harmful effects of bio-active blue light at night. 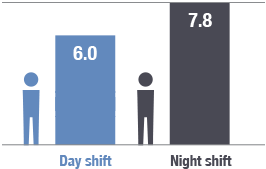 Our intelligent LED lights provide both your day and nighttime workers with an energy boost for maximal productivity and mood, while at the same time reducing overall fatigue and errors. 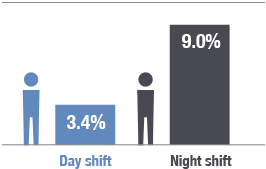 As day progresses into night, Circadian Light greatly reduces your exposure to the harmful bio-active light that has been shown to increase obesity, diabetes, heart attacks, and cancers. No dimming or low CCT yellowing of light. Our dynamic LED lighting system provides high quality white light 24/7 – all while regulating bio-active blue light exposure – to promote alertness and vigilance. YOUR WORKERS’ HEALTH ISN’T THE ONLY THING AT RISK. 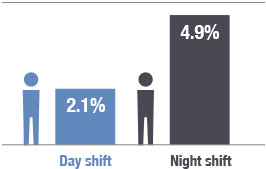 Compared to a day shift worker doing the same job, a night shift worker costs your company an additional $11,000 per Year. 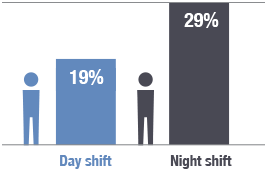 CIRCADIAN Light is solving the health and financial risks of night shift work.